GHK coach Cammy Little praised his side’s strong defence after the BT National League Three side progressed to the BT Cup quarter-finals at the expense of Selkirk on Saturday. The Old Anniesland side have not lost a match all season in any competition and with the wind and rain around at the weekend they fancied their chances of causing an upset against their BT Premiership opponents in round three. In the first half Selkirk played the conditions pretty well and went ahead with a converted try, but then they failed to push home their advantage and in the second half GHK stepped things up a level. Mike Borthwick, Danny Campbell and Marc Taylor were the tryscorers for GHK, while Mike Martin was on form with the boot as they came out on top 21-7. Little said: “Myself and fellow coach David Mitchell are very proud of the way the boys stuck at things in this match. In the first half when Selkirk got one try they could have gone on and taken the match away from us, but the team defended really well and kept them out. “Going in at only seven points down at half-time gave the boys real hope and they regrouped and then started playing some of the rugby we know that we are capable of in the second 40 minutes. “Once we get on the front foot in matches we are quite hard to beat and I must take my hat off to the guys for the belief they showed against top-flight opponents. Currie and Heriot’s are the other clubs safely through to the last eight. Two early tries by skipper Ross Weston set Currie on the way to a comfortable 31-0 win over Watsonians at Malleny Park. That double put them 12-0 up at the interval and then Richard Snedden, John Cox and Thomas Gordon crossed in the second 40 minutes. The only negative for Currie was that they had front-row man Shaun Ruwers sent off in the second half. Currie No 8 Weston said: “It was great to get the win as it’s been a difficult second half to the season with weather disrupting games. 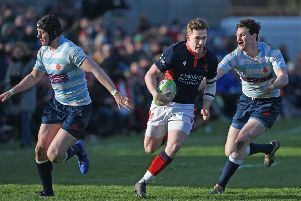 “Watsonians were tough opponents in difficult conditions so it was good to get a challenging game and go through to the next round of the BT Cup. There was drama right until the last minute at Riverside Park as Jed-Forest came very close to knocking out Heriot’s. Heriot’s were trailing 19-12 in the Borders until a penalty by John Semple and then a try by Max Learmonth put them 20-19 up. In injury time Gregor Mein had the chance to win it for Jed, but his penalty effort just drifted wide of the post. The Stirling County-Ayr and Hawick-Melrose third-round ties were postponed. In round two matches, Dundee HSFP, Cartha Queens Park and GHA progressed. Dundee were 19-7 down to Falkirk at Mayfield at one point, but managed to turn things around to come out on top 27-19. For Cartha, in their tight match against Aberdeenshire, Graham Williamson and Graham Docherty were the heroes. Williamson scored a hat-trick of tries while Docherty bagged two as they headed back to Glasgow with a 25-20 victory under their belts. GHA were also on the road and returned from Biggar with a 26-18 triumph. Their tries were scored by James Edgar, Andrew Goudie, Andrew Gillman and Rangi Jericevich with three conversions by Peter Jericevich. The BT Cup continues this coming weekend with five third-round matches due to be played.